Not too long ago our Lisa Stoner Events team was asked to plan an Orlando wedding industry event for our colleagues at The Knot. We chose a “White-Hot” theme and we loved every aspect of it. White really lends itself perfectly to Welcome Receptions and provides for a fun wedding weekend and also to summer events. Start with a beautiful location; in this case the all-white tented space at the Waldorf Astoria Orlando was the perfect blank canvass for our design. 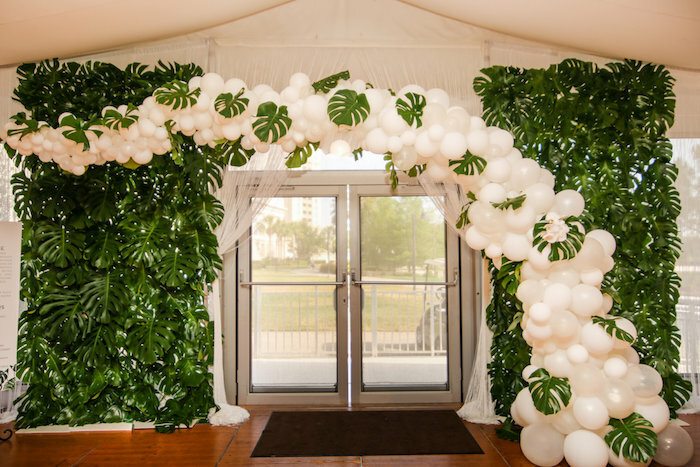 We started with a dramatic entrance feature: a show-stopping white balloon arch combined with lush white greenery. The next design element was the layout of the space itself. A beautiful white orchid chandelier hung over the dance floor area in the center of the tent. An abundance of modern lounge furniture was spread across the room, providing ample seating for guests. Our design team incorporated multiple food stations, enticing the guests to sample delicious, lite, bite sized samplings while mingling and dancing. Speaking of dancing, we were sure to bring in an amazing DJ to keep the dance floor packed. Another element not to be missed was a refreshing signature cocktail, uniquely presented from a feature bar, by our energetic bartenders. The mojitos were refreshing and plentiful. For some interactive entertainment we drew guests into the party with a vibrant acapella flash mob and a fun photobooth with props. Last, but certainly not least, we cannot forget about the sweet tooth. Guests were treated to some delicious, miniature sweet treats. Remember to invite some stylishly dressed guests to help with the authenticity of the theme. We know your family and friends will have as much fun with a fabulous White-Hot Party as our colleagues did. Be sure to call our Lisa Stoner Events team to discuss designing your upcoming wedding, milestone family event or corporate gala.